After nine years of living in Nicaragua, Darrell and Amy Bushnell still feel it was a great choice for their retirement. 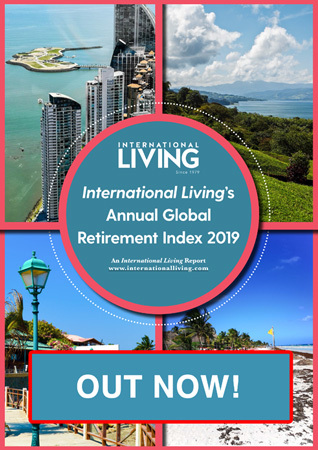 The people are friendly and accepting, the cost of living is low, and a welcoming expat community provides a busy social life. Shortly after Amy’s mother passed away, they decided they were ready to make a new life for themselves overseas. They wanted a place that was affordable, safe, and convenient to the U.S. 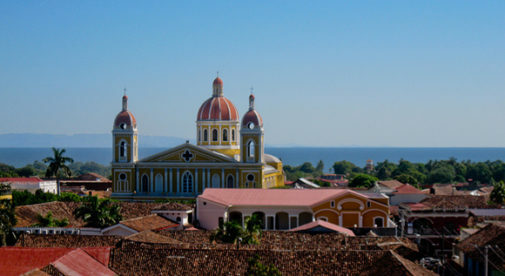 They had traveled extensively throughout Central and South America, but Nicaragua always came out at the top of the list. After a few months by the ocean in San Juan del Sur they moved to the colonial city of Granada. “And we have been here ever since,” says Amy. 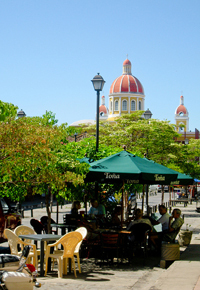 Nicaragua’s tropical climate means eating al fresco is an easy pleasure in colonial Granada. The low cost of living in Nicaragua was a real draw for them. They live comfortably on Darrell’s Social Security and pension and spend less than $2,000 a month. They pay $150 a month for utilities, which includes water, electric, cable TV, and internet and their housekeeper and a caretaker cost $280 a month. The running costs for their two cars, including gasoline, insurance and tag taxes, costs a little over $100 per month. They also go out occasionally to wonderful, inexpensive restaurants in Granada, spending around $150 to $200 per month. They had their home built. It’s a 2,000-square-foot house with two master suites, two bathrooms, a large kitchen, a living room, and dining room. They also have a large veranda and patio and a swimming pool. The total cost was $150,000, including the land. Granada has two hospitals and the cost is extremely affordable. Amy had a friend who had an emergency gall bladder removal for which he only paid $50 for some medications. A visit to an excellent local doctor is a mere $15 and for more serious problems the capital of Managua, just 35 minutes away, has hospitals with world-class specialists. Amy says, “We keep ourselves busy with community projects. I have a studio where I teach painting, and Darrell writes an online newsletter and administers several other websites.” The couple also like to golf and although there are only four golf courses currently in Nicaragua, they get to play a few times a year. Prices run from $45 per round up to $250 for the most exclusive club. Life in Granada for the Bushnells is good…their only regret is that they didn’t do it sooner.